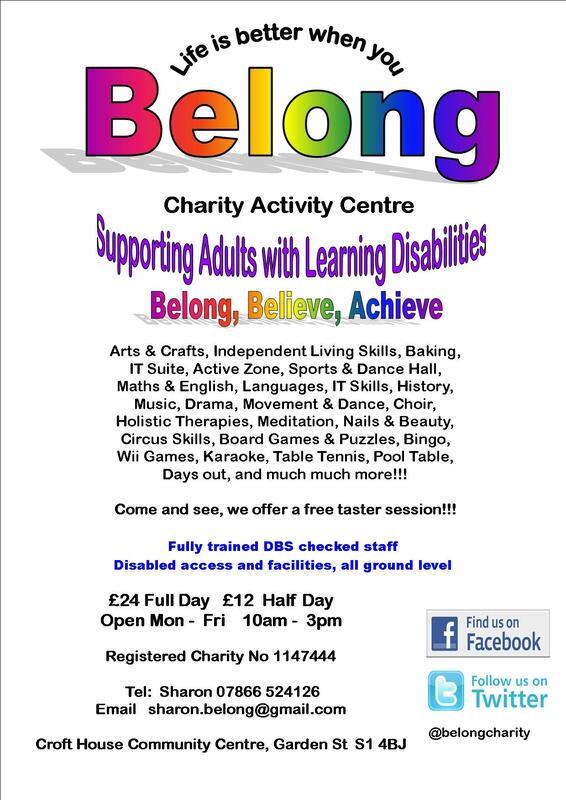 Belong is a small charity, not for profit activity centre supporting adults with learning and/or physical disabilities, dementia, mental illness or elderly. We provide a wide range of educational ,social, recreational, creative and fun activities. Including..Baking, Arts and Crafts, Textiles, Table Tennis, Pool, Nail art, Drama, Makaton, Meditation and Relaxation, Movement and Dance, Karaoke, Music, IT, Languages, Maths and English, Independent living skills, Games and puzzles, Day trips and much much more. Facilities include an IT Suite, large drama and dance studio, a large activity room, a chill-out lounge and snack bar, kitchen, disabled toilets and access all on ground level. We offer free taster sessions! Belong ocupy the ground floor of Croft House Community Centre which is all one level. Wheelchair accessable from the street.